Registration for INANE 2017 is officially closed! There will be 140 of us gathering in Denver next week for the conference. See you soon! Introducing: the INANE Virtual Journal! What is the INANE Virtual Journal? It is a new initiative for INANE 2017, designed to help showcase the variety and creativity of the journals that represent the INANE membership. We know that journal editors, their editorial boards, peer reviewers, authors, and publishers work hard to create high quality publications of which they are justifiably proud. The INANE Virtual Journal is being developed as a way to showcase the important contributions that INANE member journals make to nurses in practice, academia, research, and leadership positions. To create the INANE Virtual Journal each editor will select one article from their journal to be included. A citation list of the articles will be on the INANE Website along with PDFs or links to the article on the journal website. This will allow those who access the INANE Virtual Journal to read the content. The INANE Virtual Journal will be password protected so only INANE members will have access–this is being done to be mindful of copyright restrictions. The password will be shared at INANE 2017 and also on the INANE Email Update list. Why is the INANE Virtual Journal being created? Primarily to highlight the diversity of scholarship that is included our journals and to be inclusive of all journals, including those that are online only, online and print combinations, as well as traditional print. A second reason is to continue our efforts to have the INANE conference be paperless. The INANE Virtual Journal will replace the journal display which has been a tradition at the INANE conference. The journal display suffers from being expensive (shipping journals to the conference) and wasteful (many journals are thrown in the trash when the conference is over). We hope that the INANE Virtual Journal becomes the new tradition that more fully reaches INANE members and captures content in a vital, meaningful, and creative way. Questions? Comments? You can comment directly on this post, or send a message through our contact form. Someone will get back to you right away! Click here to access a page that has all the details about the INANE Virtual Journal. Click here to access the form for submitting an article for the 2017 issue! As everyone knows, sponsors are essential to help us put on a successful INANE Conference. This year we have four generous sponsors and we are grateful for their support. 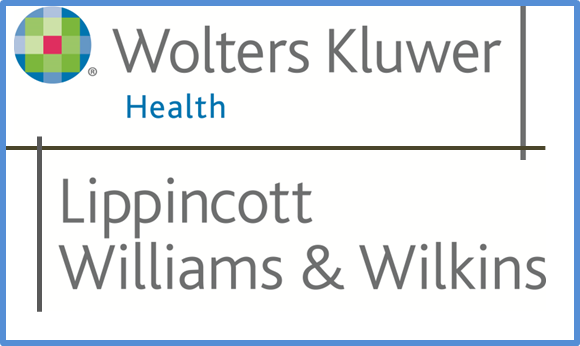 Wolters Kluwer/Lippincott Williams & Wilkins will once again be sponsoring Guidebook! We have three sponsors at the Bronze Level: Elsevier, RCNi (host of last year’s very successful INANE in London), and Slack, Inc.
We are proud to display their logos on this website and acknowledge their ongoing support of INANE! Abstract Deadline Extended to January 31, 2017! Take note of this important announcement: the deadline to submit abstracts for INANE 2017 has been extended to January 31, 2017! We made this decision because the INANE/MEDICC trip to Cuba is taking place January 14-22. Several INANE editors are registered for this trip and we wanted to make sure that everyone has sufficient time to submit an abstract for the conference! We have several terrific keynote speakers lined up, but the breakout sessions and posters are the “bread and butter” of an INANE conference. This is the time when you can share your innovations and your great ideas with your colleagues–and receive feedback and discussion through the interactive format of the session. If you have been thinking about submitting an abstract but haven’t quite gotten to it…here’s your chance. The deadline is 3 weeks from today and won’t be extended again. Submit your abstract online–it is quick and easy. If you have any questions, send a message through the contact form. Thanks and I look forward to seeing everyone in Denver!